Send Mixed Roses in a Round Basket to Chennai. Gifts to Chennai. Send Flowers to Chennai. 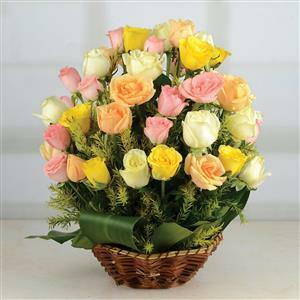 Description : This flower basket with 50 mixed roses, comprises of orange, pink, white and yellow arranged in a in a round basket. You can send this impressive flower basket as Gifts to Chennai to your loved ones on any upcoming occasion or festival. Apart from flowers, you can browse through Gift2Chennai.com to check other items arranged in the portal. Send gifts to your loved ones Chennai and make any occasion even more special.